Mostly sunny. High 64F. Winds N at 10 to 15 mph..
A few passing clouds. Low near 40F. Winds light and variable. 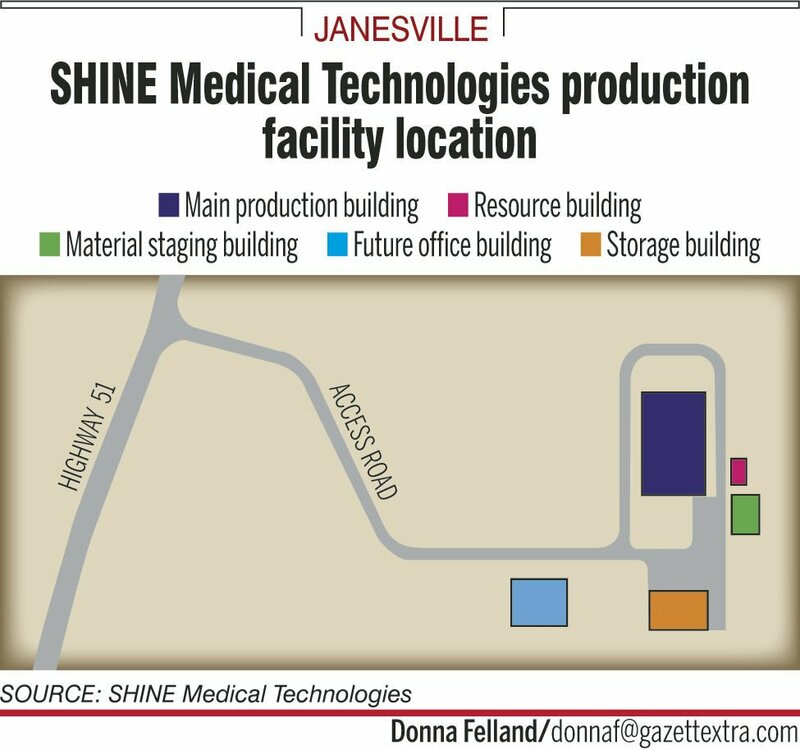 SHINE Medical Technologies now has most of the permits necessary to begin construction at its south-side campus following approval Monday from the city plan commission. Monday’s approval covered SHINE’s preliminary and final development plans for the site at 4021 S. Highway 51, just east of the Southern Wisconsin Regional Airport. Plan Commission Chairwoman Kathy Voskuil said most of the items approved do not need additional city council approval, meaning the company is “good to go” for construction. The commission unanimously supported the plans, and no residents spoke in opposition at a public hearing. The company plans to manufacture molybdenum-99, a radioisotope that decays into technetium-99m, which is used to illuminate tissue in bone and heart scans. Most Mo-99 is currently produced overseas. Site plans provided to the city show an access road leading east from Highway 51 to a cluster of buildings that surround a main production facility. Smaller buildings include areas for material staging, resources, storage and administrative offices. Katrina Pitas, SHINE’s vice president of business development, said the company would consider doing a groundbreaking ceremony before winter. Either way, heavy construction would not begin until spring 2019. SHINE must still secure a transportation access permit from the state Department of Transportation that governs the road leading off Highway 51. The company can begin construction without the permit but would need it before any significant work begins, Pitas said. SHINE submitted that permit application last week and is expecting approval “in the coming weeks,” she said. The company also needs to get an operating license from the federal Nuclear Regulatory Commission. SHINE already received a construction permit from that agency, and it doesn’t need the operating license until the company is ready to begin operation, she said. That date is set for sometime in 2020. SHINE finished construction on its Building One prototype facility earlier this year. The equipment needed to begin production tests could arrive this month or next month. Tests would begin this winter, Pitas said. Monday’s approval was a significant step for a project that hasn’t gotten started as fast as the company initially thought. This computer-generated image shows how SHINE's future construction at 4021 S. Highway 51 would look.